The T82 HMC is an American tier 4 self-propelled gun. SPG on the M5A1 chassis designed for jungle warfare. The vehicle featured a 105 mm light howitzer mounted in an open-topped cabin. Development started in November 1943. In August 1944, two prototypes underwent trials on the Aberdeen Proving Ground. On June 21, 1945, the project was discontinued due to the lack of interest in vehicles of this type. 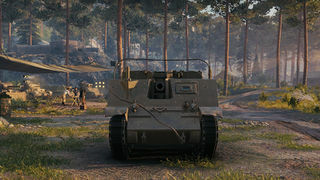 The T82 HMC leads to the M41 HMC. The SPG can damage vehicles of its own tier effectively but struggles against anything higher. The splash isn't too impressive (read: next to nonexistent), but better than its counterparts such as the SU-26. 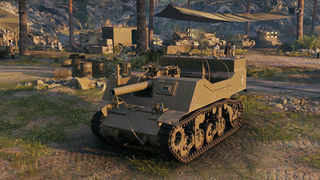 If you have played the FV304 already, this SPG will feel very familiar. 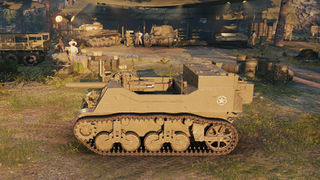 If you have played the Hummel instead... well, wait until tier 5. The tracks improve traverse speed, which is much needed on this vehicle, get it first. Next, get the top gun, which improves aim time and accuracy. Development of the T82 started in December 1943. The vehicle was put on trials in August 1944, but was never mass-produced, nor saw service. 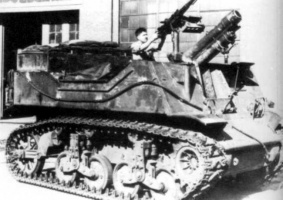 The T82 was a SPG built by the Heil Company to a specific Ordnance Department requirement for a light vehicle for Pacific theatre of operations. This vehicle was equipped with the M3 105mm howitzer which could fire a 30 pound projectile about 5 miles. The T82 was based on the M5A1 Stuart chassis and could carry 58 rounds of 105mm ammunition. This page was last modified on 23 February 2019, at 10:20.